FARMINGTON - The Bristol Chamber of Commerce’s 27th annual golf tournament, popularly known as “The Big One,” was played Monday. “The people who play have changed, but the play itself has not,” Cindy Bombard, president of the Central Connecticut Chambers of Commerce, said of the tournament, run by the Chamber. 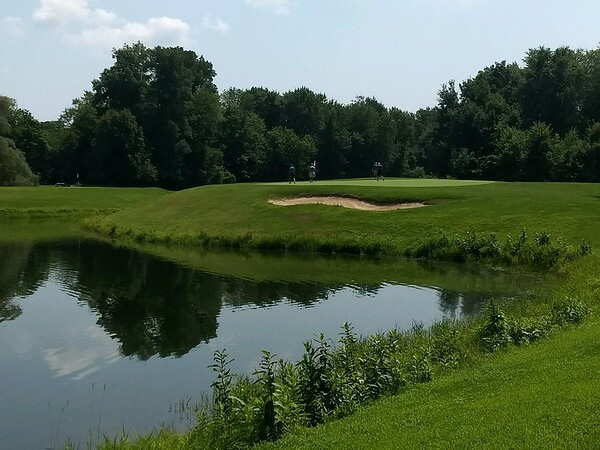 The tournament was held at Tunxis Country Club, chosen for its large size, said Pete Peterson, who has worked at the club for the last 14 years, and has helped organize the tournament for the last three. The club has two 18-hole courses and one nine-hole course. The tournament uses a scramble format and the 176 players represented businesses that belong to the Bristol Chamber of Commerce, among them ESPN and Webster Bank. Bombard said the tournament helps raise money for local not-for-profit organizations. Among the competitions Monday was a nine-hole contest for women only. Also, on the par-3 fourth hole of the White Course, golfers had the chance to win a blue Harley Davidson motorcycle for a hole-in-one. The club is owned by the Tomasso family and the club pro is Angelo Fiducia. For answers to questions about the tournament or the club in general, call the pro shop at 860-677-1367. Posted in The Bristol Press, Bristol on Monday, 6 August 2018 21:35. Updated: Tuesday, 7 August 2018 09:31.